A review of Ink and Bone by Lisa Unger. Post may contain affiliate links. 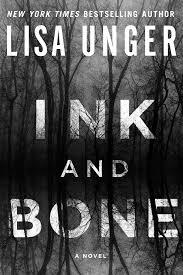 Ink and Bone by Lisa Unger is a good solid psychological thriller. Merri and Wolf Gleason’s daughter Abbey is abducted in the woods while hiking with her father and brother. The guilt of both parents and the effects on the family dynamics plays a big part in the story. Merri unwilling to give up, enlists the help of a P.I. who uses a medium to find missing people. The P.I. normally uses Eloise, however her granddaughter, Finely also has the “sight” and she is the one who is repeatedly hearing the “squeak clink” sound. She doesn’t know what the sound means and she doesn’t know if she is strong enough to step in her grandmother’s footsteps, but she is drawn into the case. There are plenty of twists and turns in this mystery. The characters are very well developed. I stayed up late a couple of nights reading this, I simply couldn’t put it down. I like a good mystery so I will add this to the Goodreads shelf.